The principle behind whole house ventilation is to change the air continuously in the house and use the recovered thermal energy to warm (or cool) the incoming air depending on the season. Extract points are located in wet areas such as bathrooms, kitchen, utility and WC. Supply points are in areas such as bedrooms, offices, studies, living and dining rooms. The heat exchanger transfers up to 95% of the energy from the extracted air to the incoming fresh air. What is involved in installing the system? The MVHR unit is generally located in utility rooms such as laundries, garages, or cupboards for easy access to filters and general maintenance. A ducting system is installed to extract air from wet and odorous areas, and similarly supply air to bedrooms, living rooms, and other occupied spaces. MVHR units are controlled either via controls on the unit itself (depending on models), or via a remote panel. Boost/ over-ride switches can be installed outside each bathroom or in the kitchen to boost the unit to full speed if necessary. An ordinary GPO socket is required to power most MVHR units (smaller decentralised units are typically hard wired). What is the difference between MVHR & normal house ventilation? A house fitted with a Mechanical Ventilation Heat Recovery System will have no background ventilation holes in the walls to the exterior of the building. No trickle vents will be necessary in the windows. Bathrooms will not require mechanical extract fans. Comfort levels are superior in a house fitted with a MVHR system. Irrespective of weather conditions draught free balanced ventilation is provided all the time. The right amount of fresh air is available 24/7. Energy costs are lower. Water vapour will be removed as it is produced, substantially reducing the risk of mould growth. Mould can have a high allergic potential leading to health problems. Houses are also more secure because there is no need to have windows open. Your home will have a constant supply of fresh air, lower heating bills, higher levels of comfort and a method to remove any condensation that may form. The system also helps protect the fabric of the building (your investment). It is recommended that the whole house is covered by the system to offer a maximum efficiency. Will it work with all heating and cooling systems? MVHR is independent of the heating/coolings systems in the house. In fact, the extraction from wet areas will lower the moisture contents in the air resulting in a drier home. As a consequence, the efficiency of any heating/cooling devices will be enhanced. It is important that all heating/cooling devices only recirculate air already inside the building, as the MVHR system handles all outside fresh air requirements. This prohibits the use of typical evaporative coolers, if you wish to maintain efficient building operation. In the course of building what steps should be taken to ensure that a MVHR system will work well? The house should be well insulated and well-sealed. This means that there will be minimum heat loss and that the air flow through the house can be controlled. Does insulation and U values of doors and windows have any influence on the operation of a Heat Recovery Ventilation System? In order for the MVHR system to work effectively, a house should be well insulated. Good insulation will prevent heat loss through the walls, floor and attic. Windows and doors are generally the weak point in the building envelope as regards heat loss. Even the good triple glazed versions lose around three times more heat per square meter than the walls. So size and orientation of glazing is important. It is important to remember that MVHR provides fresh air (to maintain indoor air quality), whereas indoor temperatures are a result of the performance of the building fabric (insulation), and any heating or cooling applied. What are the Health Benefits? Why should I install MVHR? On average most people spend over 80% of their time indoors. Illnesses can be caused by or aggravated by poor indoor air quality. Reduced dust and pollen levels benefiting asthma and hay fever sufferers. Can I buy the unit and materials and self install? We do advise that the MVHR units should be installed by one of our trained installers, as there is specialist knowledge required for assembly of some components, and commissioning. This ensures that you end up with a high performance MVHR system. Contact your appropriate New Zealand or Australian Fantech office (see contact page on this website). One of our representatives will contact you to discuss. If you can provide pdf floor plans, that will assist. At what stage in my build should the MVHR system be installed? For a new build, this would be as soon as the roof and cladding is up. Preferably before the plumber is on site. If an air tightness membrane is being used, some co-ordination and preparation will be required to accommodate penetrations. Duct work needs to be installed before plastering. The final MVHR unit fit off can be done later in the building process. Best practice is to have the unit completely inside the insulated envelope and (if possible) centrally located. Areas such as laundries make ideal spots. Avoid locating beside sensitive rooms such as bedrooms where possible. Access to the unit for periodic filter changes is required. The control panel can be located anywhere. Everyone has a preference that best suits their needs. We leave this choice up to the home owner to direct. We also recommend each bathroom have a boost switch fitted. This allows the system to boost while showering. A smooth antibacterial liner made from pure HDPE, a food grade plastic. Is cleanable with a customised cleaning system (speak to your installer). Comfopipe is used for the outside air connections. It is made from high quality high density polypropylene and importantly provides insulation which eliminates the chance of condensation occurring inside / on the ductwork. Can a MVHR System be installed with flexible ducting? No. We strongly recommend that rigid ducting be installed at all times. Flexible ducting creates resistance to air flow and will lower the efficiency of any MVHR unit, and increase noise levels. Flexible ducting is impossible to clean or maintain. Flexible ducting is difficult to stretch leading to the creation of low points, and the potential for bacteria growth moisture accumulates. Can the system have automatic humidity sensors? Some units such as the Zehnder Q series have inbuilt humidity sensors to control operation. Humidity sensors respond to changes in the moisture of the air and can be used to increase the airflow if needed to eliminate excess moisture. Please contact use to discuss which solutions might be appropriate for your project. Best practice is to run all ducting ‘completely inside the insulated envelope’. Ducting that must run outside the insulated envelope will need to be protected from the extreme temperatures experienced in the roof space. The recommendation from the Passive House Institute for ducting outside the insulated envelope is to be covered with no less than 150mm of insulation and to be completely free of air gaps. For this reason we always recommend installation inside the insulated envelope. Do I need wall and window vents? Window vents are not required or recommended. Zehnder’s ComfoSystems are a balanced ventilation system. This means the supplied air volumes, and extracted air volumes are the same. Zehnder have a range of grille options to suit including designer styles. Please contact use to discuss which solutions are best suited to your project. Fantech recommend and specify Zehnder’s ComfoFresh ducting system. Ducting from the external to the unit is generally approx. 190mm O/D, or 210mm O/D. Sizes may vary. Ducting from the unit to the internal grilles is generally 90mm round O/D with some alternatives available to overcome obstacles. Please contact use to discuss which solutions are best suited to your project. Where is fresh air supplied from and exhausted? External fresh air should be drawn from the cooler shaded side of the house. This assists during summertime when pre warmed air is not welcome. Fresh air should never be drawn in from a sun drenched hot surface such as dark timber in summertime. Stale air can be exhausted anywhere that is convenient. Duct runs from the unit to the external should be kept as short as is practicable. Separation of the supply and exhaust air grilles should be no less than 1 meter. This is not recommended by Fantech primarily because of the risk of duct and heat exchanger contamination with grease and oil. We suggest a recirculating range hood with carbon filters to absorb odour. If cooking odours are expected to be very heavy, an externally ducted rangehood can be used however consideration of make-up air requirements in air tight buildings is required. Contact our company for more information. Yes, as a safety feature we can connect your fire alarm system to the MVHR unit. We will require a two core cable from the fire alarm panel to our unit. Our unit will cut out in the event of the alarm going off. Air-tightness is the control of air flow through the external envelope of the building. In an airtight building air leaks do not occur at ceiling or wall junctions, plaster board joints, doors, windows, service entry points etc. Leaks create discomfort, thermal energy loss, and compromise indoor air quality. The result is that your heating system has to operate at a greater capacity to compensate for the losses. Air-tightness is essential in maximising the effectiveness and longevity of thermal insulation, ensuring vast savings over a lifetime. Why should air tightness be looked at in the context of MVHR installation and operation? An MVHR system relies on warm air from the interior of the house returning to the unit and exchanging its heat with incoming air. If that air is taken in part from leaks and openings in the building shell, then the overall temperature of the extracted air will drop affecting the overall efficiency of the MVHR. Low levels of air tightness also compromise indoor air quality. How should the air-tightness of an existing house be approached? Fitting draught stripping in the frames of the openable parts of windows, doors and roof lights, etc. Consider the use of an air tightness membrane in new builds that greatly aids in achieving a high level of air tightness. 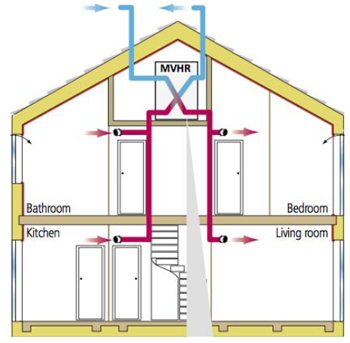 What level of airtightness should be achieved so that a MVHR system will be beneficial? In general we recommend buildings aim to achieve an airtightness of at least 5-6 air changes per hour when tested a 50 Pa (std test pressure) to justify the investment in quality MVHR units. Should the MVHR system be on all the time? It is recommended that the system run continuously. This will help maintain high indoor air quality and avoid the build-up of smells, moisture, condensation, etc. If you are going away reduce the units speed to the lowest setting. How efficient are MVHR units? This will vary from house to house but an indication for a 200 m2 housing using a correctly designed and installed Zehnder Comfoair Q system is about 35 watts. This amounts to a little under 1 kWh per day, and at 30 cents / kWh amounts to about $100 per annum in electricity consumption. What are the settings on the switches? The unit comes with three main settings. Low speed: At this setting the unit will replace the air once every 4-5 hours. It is used when the house is not occupied and is designed to provide condensation protection, and maintain freshness. Medium speed: An air change will take place a minimum of one air change every 3 hours. This is known as your standard or nominal ventilation rate. Boost: This setting is used when a large amount of water vapour and/or heat is generated in bathrooms etc, or when large numbers of people are present in the building. The unit runs at 70 - 100% of its capacity. Once it is activated, the unit can work at high speed for a period of up to 120 minutes and then reverts to normal ventilation rates. If several boost switches are installed in the house, the last boost switch to be activated will determine when the unit will return to normal working. Is a condensation drain necessary? For HRV MVHR units that are used in cooler climates a condensate drain is required. This is supplied on some models. ERV style units that are used in warmer humid environments don’t require a drain as moisture is removed via internal airflows. Contact your installer / system designer for advice on whether an HRV or ERV style is needed. This is always determined on the basis of climate and not on the availability of a drain point. Better MVHR systems are designed and selected to be very quiet during normal operation. This is achieved by the use of unit insulation and duct mounted silencers. We always recommend locating the MVHR unit away from sensitive areas such as bedrooms. Zehnder MVHR units are the quietest available in their class. What can I do to keep the house cool in summer? It is important to remember that the primary job of an MVHR system is to provide fresh filtered air to you house and extract damp and odorous air. MVHR systems have a limited impact on either cooling or heating buildings. This is something that should be managed via good building design (high performance building fabric, orientation, shading etc). Better MVHR units incorporate bypass valves that allow outside air to bypass the heat exchanger when it is favourable to do so, in order to help achieve a target comfort temperature. A typical example is night purging during summer. This operation is typically automated and does not require any user action. In order for the system to work correctly and effectively it is important that approved maintenance procedures are followed. Full details are in the manual supplied. The main component of maintenance is filter changing. The frequency of this will depend on your external and internal environment but 6 months is a typical replacement frequency. Is it easy to clean and replace the filters? It is a DIY job, no tools are needed and full directions are given in the operator manual supplied. Contact your installer to order replacement filters. You will require replacement filters when filters can no longer be cleaned by gently tapping them to remove dust. The HRV unit should not be run without filters, as this exposes the unit and your building to unfiltered air. What warranty comes with HRV systems? 2 years form date of purchase. Other Fantech HRV product: 1 year from date of commissioning ( up to a maximum of 18 months from purchase). This warranty is obviously conditional on equipment being installed and maintained in accordance with the manufacturer’s instructions. Is it possible to clean the ducting installed by Fantech? Yes, because we use solid ducting it can be cleaned. Contact your installer for details on how often this may be needed, and how this can be carried out by the installer. High performance buildings typically require low levels of heating so consider whether you require this type of heating to begin with. Open fire places are not recommend due to the large degree of imbalance created in the building internal air flows. Open fire places also generate contaminants such as PM2.5 particles and CO, both of which can present health risks to occupants. An alternative is a high performance sealed combustion heater that has its own dedicated supply air duct (typically underneath the unit) that maintains a balanced airflow within the heater (and therefore the rest of the building). What effect will a free standing stove have on the MVHR system? Well maintained gas stoves burn much more cleanly than wood fuelled heaters/stoves and therefore the primary products of combustion are CO2 and water vapour. These can become a problem if left accumulate for long periods, hence the reason a typical MVHR design includes an extract point nearby. A range hood should always be used to deal with the odours from cooking. For normal residential cooking duty we recommend a recirculating range hood with a charcoal filter. This way the air balance of the building is not upset. How should a gas fire be connected up? Gas fires and heaters pose an increased risk of CO emissions when not adequately maintained. They should always be of the flued variety (i.e have an exhaust so that the products of combustion are discharged to atmosphere). If required we recommend the high performance variety that is fully sealed with its own external supply air duct. In general our recommendation is to consider high efficiency electrical sources of heating /cooling that can be power by renewables (either now or in the future). Examples in include heat pumps / split system air conditioning unit..